It’s official! 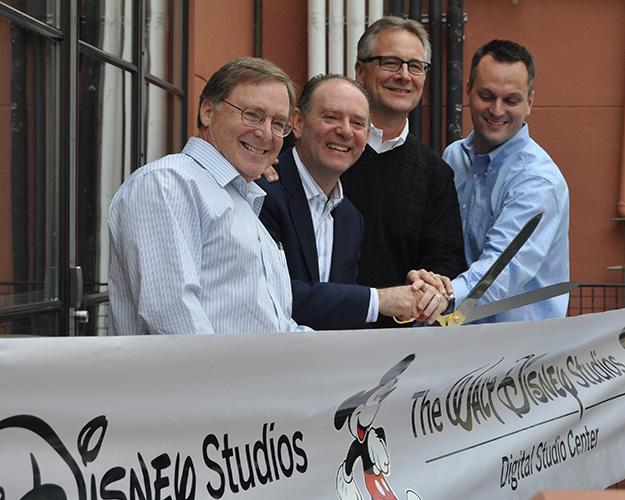 On December 12, 2012 at 12:12 PM, a new era in the history of the Walt Disney Studios was inaugurated with the cutting of the ribbon for the new Digital Studio Center. Our new future-focused, next generation, digital on-lot infrastructure, was opened by Walt Disney Studios Studio Operations President Jeff Miller, Walt Disney Studios CTO, Jamie Voris, Vice President Technology and Strategy, Michael Jedlicka and General Manager, Digital Studio Leon Silverman. At Disney Digital Studio Services we’re all about “On Time” delivery. And of course, that extends to the opening of our new Digital Studio Center, which will absolutely open on time at precisely 12:12 PM on December 12, 2012. 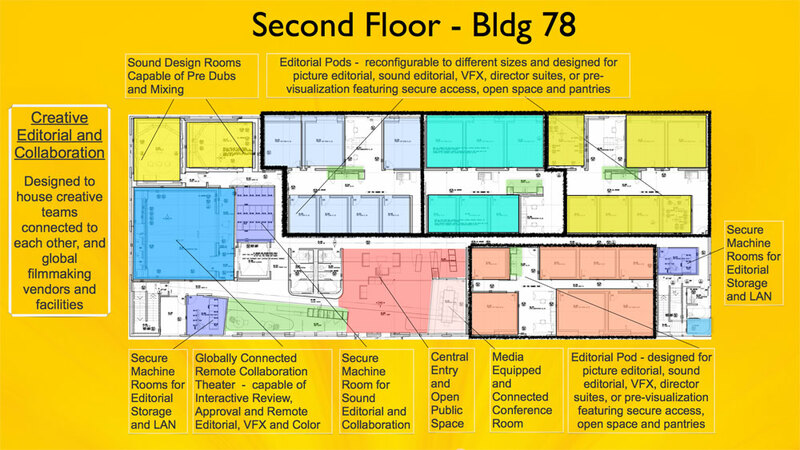 Our new Digital Media Center and centralized digital file-based workflow hub occupies approximately 8,000 square feet of space on the Ground Floor. In addition, we built out the entire Second Floor of approximately 17,000 square feet to house our new Creative Editorial, Sound Design and Global Collaboration Center. Our new Digital Studio Center was designed to provide a home to the many technical functions that are increasingly part of today’s digital media production, post production and distribution workflows. This new facility will serve to prepare files for all phases of the Walt Disney Studio’s content life-cycle, as well as house a new modern home for our filmmakers and their new increasingly integrated and collaborative creative editorial and finishing workflows. The Ground Floor Digital Media Operations Center is built for today’s digital file-based workflows, but was also designed to adapt as technology changes. The Digital Operations Center houses a number of flexible technical utility rooms and central workflows areas and acts as center of our digital operations. The DMC features the latest digital file technology and staff trained to offer services including ingest, encode, transcode, transport, validate, edit, conform, sync, QC and media review in a wide array of file types and resolutions. From our centralized open Digital Operations Center, we can monitor the status of all activity in the facility as well as initiate a host of media transformation tasks. 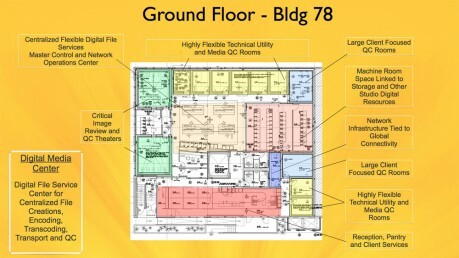 In addition, each of our flexible technical utility rooms, large client focused QC environments and our Digital Review Theaters are built on an isolated concrete slab, with double wall “room within a room” construction to ensure that each of our technical spaces (which can all monitor in 7.1 sound) offers the truest and most accurate image and sound reproduction available – free of image or sound distractions. Each room can monitor in either 2D or 3D with the latest in industry reference monitor technology as well as 4K projection in our Digital Review Theaters. 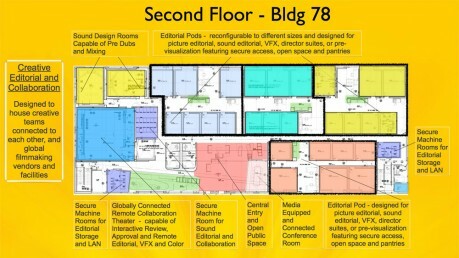 The Ground Floor of the Digital Media Center connects to specialized production and work-in-progress local storage as well as centralized secure storage for media operations. The Digital Operations Center will focus on content preparation and asset validation to ensure the validity of Walt Disney Studio’s library content stored in our multi-Petabyte Media Deport archive “private cloud” service and storage infrastructure. Disney Digital Studio Services is focused on the future of our Studio as a leader in digital content creation, distribution and archive. In our new home, we are well equipped and prepared to help make this future happen. As technical as is the Ground Floor, the Second Floor of our new Digital Studio Center is all about creativity – enabling it, nurturing it and supporting our filmmakers with the environment needed to finish films in today’s complex and collaborative workflows. Today’s films demand that picture, sound, pre vis, VFX, post supervisors, coordinators, and creative filmmakers need to interact with each other in ways that most facilities simply were not designed to accommodate. 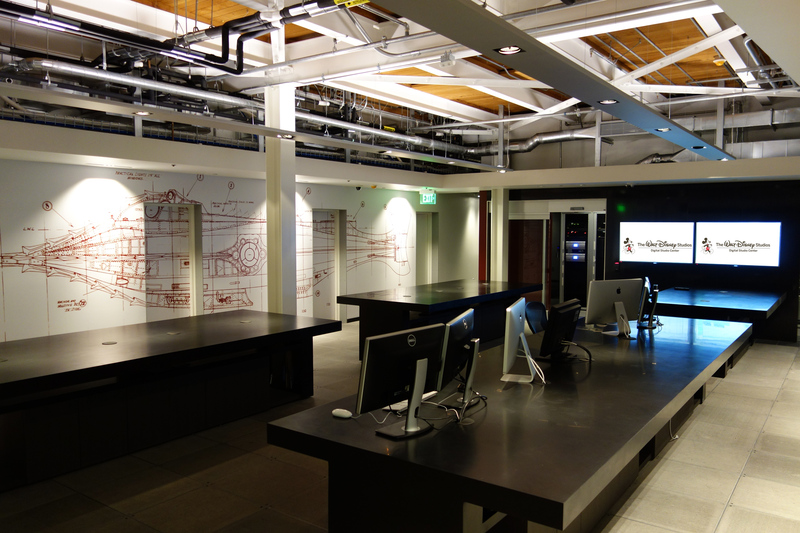 In our new Digital Studio Center, we built our infrastructure to not only be filmmaker friendly, but designed to truly accommodate the way films and their teams work today. The Second Floor is anchored by an open lobby, pantry and conference area. 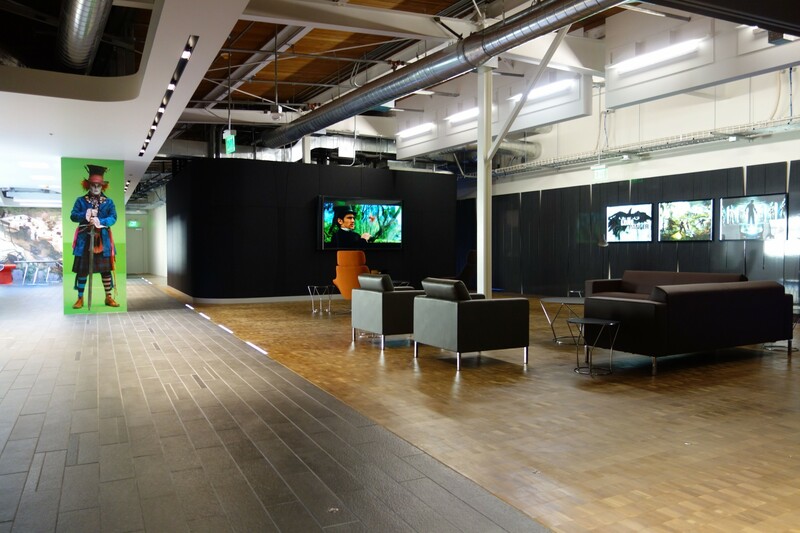 The lobby leads directly to a series of four editorial pods with secure private entrances, pantries, open spaces and spacious editorial rooms or filmmaker’s offices – all with windows and with the ability to completely black them out for screenings. Each room is also built on a concrete slab with double wall “room within a room” construction for complete sound isolation for critical image or sound editorial. Each room in the editorial facility can be controlled by individual temperature controls, which, in the past has been a huge issue for editorial spaces where one room might house significant technical equipment and others might not, leading to uncomfortable ‘too hot’ or ‘too cold’ adjacent rooms. 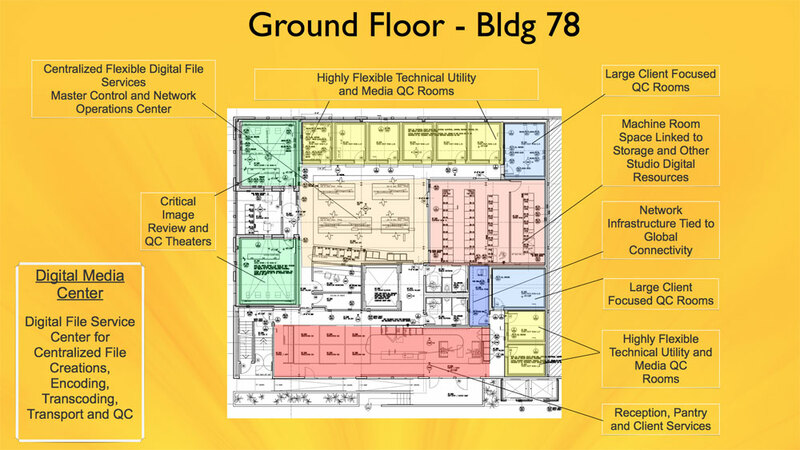 Each room has been pre-cabled to allow easy access to technical infrastructure and secure networked connectivity to a host of media processing and storage services. A pipe grid along the ceiling of each room allows speakers, projectors, monitors or lighting to be easily reconfigured for individual preference of room orientation. In addition, as the size of a production grows, the size of the pod can also grow by opening up dividing walls to create a “super pod” which can accommodate the post production needs of even the largest tent-pole films. Two Sound Design pods compliment the editorial spaces and provide for complete integration of picture and sound creativity. The ease in which filmmakers will be able to literally walk down the hall to complete sound post production during the critical and increasingly tight deadlines of the film finish will greatly enable Director’s and Editor’s abilities as release dates loom. These rooms can be interconnected with the picture and sound editorial rooms, the feature film mixing Stages and sound support facilities on the Walt Disney Studios lot and through our sophisticated network collaboration capability – to other sound facilities all over the world. These rooms will also help to lower the cost and increase the efficiency of final mixing. Work, that in the past was done on more expensive, larger Pre-Dub stages, can now be accommodated in these new rooms. This work can then feed directly into the sound editorial and mixing workstations and consoles for final mix. The new Digital Studio Center has been designed to enhance the picture and sound creative process through effective and efficient space design and proximity to talent and tools. Film-making has become global. And even when it’s local, members of the film-making team seem to be spread out all over town. During certain times of the film-making process, it seems one needs to be in multiple places at once to finish the film. In our new Digital Studio Center we can actually make that happen. Our Global Collaboration Theater has been designed so that you can plug into image Review and Approval, Color/Digital Intermediate, Picture and Sound Editorial and creative collaboration all over the world. We are literally defining and designing the ability to talk to, look at, and create with multiple global creative collaborators in one place. Conference rooms with tele-presence cameras are good for certain kinds of meetings and collaboration, but we hope that our new Global Collaboration Theater will re-define how work with partners, vendors and creative staff can take place over secure high-speed, high-quality, network connections that will allow you and your team to transport themselves into one virtual room. Now that’s cool! 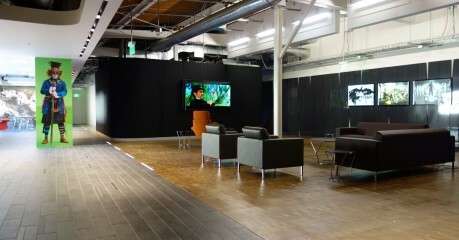 Our new Digital Studio Center has been thoughtfully and specifically designed as a space and place to do our best work. We are looking forward to sharing more of our vision with our colleagues and filmmakers as we build this next chapter in services and technical infrastructure here at the Walt Disney Studios. Our team is proud to have inherited Walt Disney’s legacy which drove him to build his Burbank Studio with a dream to create a special place to make films filled with magic and creative innovation. We plan to make our new home one that will continue to fulfill that dream well into the future.